It goes without saying that Holy Week should not be about Trump, or the Mueller report, but tell that to those who choreographed today's absurdity in D.C. It almost played out like a Holy Week "Passion play"--Attorney General William Barr lifts Trump up as the patient, but tortured victim of an attempt to smear his good name and delegitimize his “amazing” presidency, and everyone else is left with their jaws hanging open by his absolute loss of all objectivity. 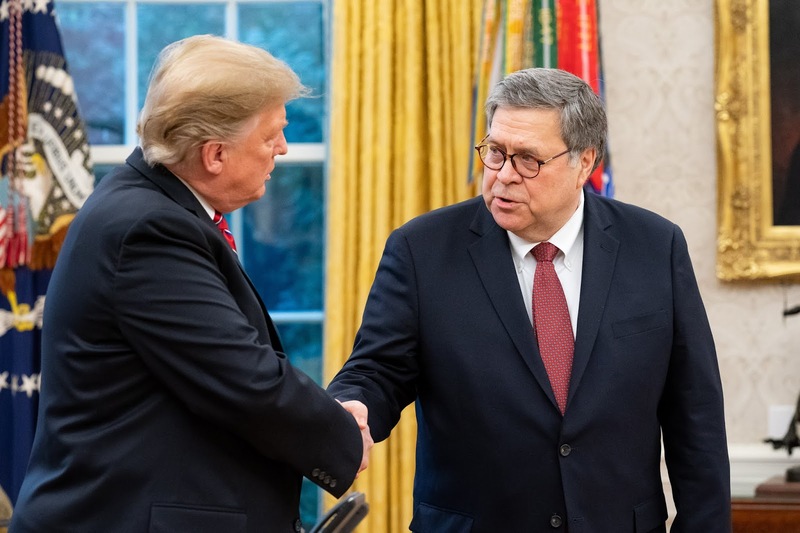 If it wasn’t clear before today’s 9:30 am press conference that Barr has chosen to become Trump’s personal attorney and protector, rather than the nation’s Attorney General, it certainly is now. In that 9:30 a.m. press conference, Barr repeatedly stated that the Mueller investigation found “no collusion” between Trump, members of his campaign or any American and the Russian effort to interfere in our 2016 election. He neglected to say that the investigation never was able to get Trump to sit down with Mueller for an actual interview because his lawyers feared a “perjury trap”—that Trump agreed only to submit written answers to questions, which would have been carefully lawyer-fied. Barr made no attempt to hide the incontrovertible facts that the Mueller team unearthed about Russia's efforts to interfere in our election, but he downplayed the part in the report that discusses how Trump and members of his team were aware of and at times welcomed Russia's help, even if they didn't criminally conspire with the Russians. The stark difference between "illegal" and "dishonorable" comes to mind here. Click here for a transcript of Barr’s prepared remarks. 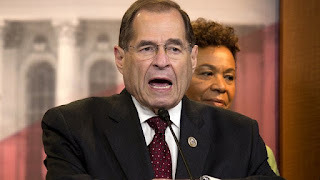 House Judiciary Committee Chairman, Jerry Nadler. Nadler protested when the DOJ told his committee that Congress would receive the report 90 minutes or more (between 11-12pm) after Barr’s 9:30 press conference characterizing its contents. Clearly, Barr’s plan to roll-out the report was calculated to give even Trump time to further characterize the contents before Congress would receive it. Will anything Congress might want to say about the report even matter with all this effort to spin and manage public perception? So Barr has put his official stamp of approval on the “No collusion, no obstruction” meme, and Trump is the beneficiary, with a nice bonus, to boot: Barr’s comments this morning simultaneously painted (without naming them) those Democratic-led committees who have a constitutional role of oversight at stake here as the victimizers, who have simply been out to get Trump who cooperated so fully. Really??! So Trump is now the suffering and redeemed “Christ” figure—right in time for Holy Week?! So, in Barr’s version of events, all those Twitter tirades by Trump that sought to demean and destroy the careers of Mueller and DOJ members, all the firings that just happened to have something to do with the investigation, and on and on…were just a matter of Trump’s “sincere belief” that he was being victimized, and that he had “no corrupt intention” and was totally justified. Are we supposed to take this as an objective conclusion? On that note, let’s take a quick peek at the 9:30 a.m. chart for Barr’s appearance on its own (Chart #1, below). Chart #1: Barr Press Conference, April 18, 2019, 9:30 a.m. DST, Washington, DC. Tropical Equal Houses, True Node. With Trump’s Gemini Sun conjunct the press conference ASC and his Moon conjunct conference Jupiter here (see Biwheel #1 below), we can deduce that Trump’s perspective on events is key here, and he does indeed think that anyone (i.e., Congress) who wants his financial information (tax returns) is “subversive.” We can only imagine that he’s suspicious of IRS workers who might cooperate with Congressional oversight, as well (spies?). Even so, numerous side investigations (not linked to the Mueller one) are looking into some aspect of Trump’s finances as we speak—that “excessive use of deceptive practices in financial endeavors” Munkasey notes could still be an anxiety-producing pitfall (Trump Moon). These investigations won’t necessarily be put off by Barr’s conclusions, but they could be weakened. These investigations are looking at the Trump Inauguration Committee’s possible misuse of funds, into the possible illegal funneling of foreign dollars into the 2016 election, into possible money laundering activities with Deutsche Bank, and so on. Could all this be simply swept under the rug because Barr wants to give Trump a clean slate? Treasury Secretary Mnuchin has been trying to make the argument that Congress doesn’t have legal standing to demand Trump’s tax returns. To my knowledge this congressional inquiry is not related to the Mueller investigation, but even so, if the Mueller report “totally exonerates” Trump, and Barr has painted him as a victim, will Mnuchin’s argument gain strength? The Southern District of New York is pursuing a bank fraud line of inquiry in regards to Trump’s taxes which is distinct from the Mueller investigation: will the aura of innocence Barr has spun around Trump hamper that in any way? It's like another miracle--Abraham parting the sea and leading his people through comes to mind. In an almost uncanny way, a number of significant midpoints in and between the two charts in Biwheel 1 below tell the story we’ve been witnessing over the past two years, culminating today. Rather than explain, let’s just proceed to the biwheel to illustrate. Setting these two charts next to each other creates a stunning visual representation of what just went down in DC between the DOJ and the White House. So this will be a very quick rundown, based solely on the midpoints in question. No doubt, Trump has a lot at stake in trying to frame the Mueller report narrative in his favor, but a lot less concern is being given for what the nation has at stake in getting to the truth of the matter. As we saw with the heavy Mutable influence on the press conference angles, there’s ample reason to believe that Barr was spinning, rather than reporting on the facts in Mueller’s report. Let’s begin. Biwheel #1: (inner wheel) Donald J. Trump, June 14, 1946, 10:54 a.m. DST, Jamaica, NY; (outer wheel) Barr Press Conference, April 18, 2019, 9:30 a.m. DST, Washington, DC. Tropical Equal Houses, True Node. Trump is ever the “alpha male,” so even the sexual connotations seem to fit here. Even without those connotations, however, this interpretation seems quite apt: we know that Trump was given more than one preview of Barr’s plans, so yes, he had time to mentally prepare, and apparently any “demands” he made that “information be used in ways he planned” were pretty carefully honored. We can’t know for sure what Trump expected or demanded of Barr, but what more could he ask for than what he got? Trump’s control-seeking Leo Mars definitely is aggressive and persistent in everything related to self-defense (ASC--Trump makes no secret that he “punches back” when attacked)—we’ve seen this behavior throughout the entire investigation, so why not now? This points to an important point that Barr ignored in his conference remarks—Trump was not a patient, complying cooperator with the Mueller investigation. If cooler heads hadn’t prevailed at some key moments, Mueller himself would have been fired! The White House cooperated out of one side of its mouth, and did its best (remember all those tortured interviews with Giuliani and others?) to destroy the investigation’s credibility with the other—that’s not cooperation. The pugilistic attack mode is far more characteristic of Trump than the picture Barr painted of his behavior this morning. The relevance here is pretty self-explanatory—Barr clearly sought to rehabilitate any damage that’s been done to Trump’s presidency, and that can’t help but boost Trump’s self-confidence (it’s difficult to see that as an issue, with his Mars-ASC). We’ve already seen the White House hint at coming “investigations into the investigators”—it’s likely he won’t be happy to simply take the victory Barr handed him without pursuing a vendetta of some kind. We can imagine that Trump has probably felt like a “caged lion” (Leo ASC) during the Mueller investigation—how can we expect him to behave now that Barr has thrown open the cage door? BPC Venus/Pluto (Aquarius) also opposes Trump Mars-ASC (Leo). This seems like an incredible “gift” of the Cosmos—all these midpoints converged around one purpose, making Trump feel better about himself. This particular midpoint is especially potent, however, because it operates on so many levels. At this point it’s good to remember that the Sibly Moon—We the People—falls at 27+Aquarius, so we’re already subject to that domineering opposition from Trump’s Mars-ASC, however today’s Venus/Pluto midpoint at that point suggests that we “ain’t seen nothing yet.” Will Trump be totally emboldened by today’s results and more determined to push tectonic changes to our society and democratic system of government? Venus/Pluto’s connection with potential “elements of organized crime” may also be right on—some of the financial investigations that remain open into the Trump organization may end up treading into that territory. One way or another, having a man in the White House who inspires such suspicions is already tearing at our social fabric—it’s not hard to imagine what the conversations over Easter dinner will be like this year! Trump’s Mars-ASC connection with the Venus/Pluto midpoint speaks to ways in which Trump could weaponize his response to any perceived threats, especially in regards to “big money.” This segues very intensely with the transits of Saturn and Pluto (Capricorn) opposite his Saturn-Venus (Cancer). He’s clearly feeling pressured financially (Venus), with his authority (Saturn) challenged and restricted by the “powers that be” (Congress and other investigations), so it will be no surprise if he puts his compliant Attorney General in charge of helping out with those as well. BPC Mars/ASC conjoins Trump Uranus (Gemini) and these points square BPC Neptune (Pisces). This is more complicated because it involves multiple points in each chart, however Barr clearly stood in front of the audience and acted (Mars/ASC) to “spin” (Neptune) Mueller’s narrative to suit Trump’s purposes (10th house Uranus). It’s no secret that Trump relishes the role of change-maker and disrupter (Uranus), and the Cosmos (and Barr) seems willing to go along with him here. The “you” that is articulating and feeling itself above the law here could be either Barr or Trump—Barr has arguably stepped way over the bounds of proper conduct for an Attorney General by spinning the Mueller report’s conclusions as he has—but considering Trump’s Mercury is involved, we can see that his viewpoint is woven into it as well. Barr’s natal Eris-North Node (Aries) square Trump Mercury (Cancer) and Barr’s natal Uranus conjoins Trump’s Mercury—Trump seems to have found his warrior/protector in Barr. Barr’s No. Node lends a fated feel to this whole relationship—we have to give Trump credit for knowing how to pick his defenders, but in accepting the protector role, Barr is redefining what it means to be Attorney General! Click here for a closer look at Trump’s chart set next to Barr’s. Timing is everything, right? Trump and company have a clear knack for staging and launching a message when and how it suits them—he wasn’t a Reality TV star for nothing, after all, and we’re definitely being played for ratings on this Holy Thursday/Passover. Both celebrations focus on victimization at the hands of corrupt regimes, and on redemption—of being held unjustly captive and finding favor from God—of death being overcome by Light and Life. If Barr orchestrated this event to consciously play to this symbolic overlay—while conveniently “dumping” the report at a time when the least number of people would want to pay attention—then he and his "team" (Trump?) deserve an Emmy for “Best Cynical Performance in a Reality TV show.” The evidence for conscious timing is weighty. You draw your own conclusions! Meanwhile, all the best to everyone for this Spring holiday weekend! Michael Munkasey, Midpoints: Unleashing the Power of the Planets, ACS Publications, San Diego, CA, 1991, pp. 208-9. Subduing this fire was an heroic task for Paris firefighters. 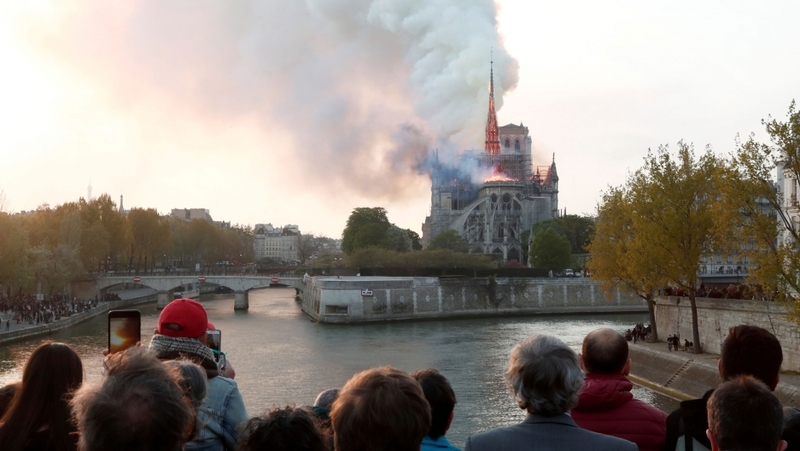 Yesterday’s shocking news from Paris was doubly horrifying: first, because a world treasure like the Church of Notre Dame—or as David Leonhardt put it this morning, “La Cathédrale de l’Humanité”—was devastatingly damaged by a fire that took nine hours to extinguish; second, because we couldn’t help but feel the gut-wrenching trauma heaped upon the citizens of France with this fire. I daresay there are no words for the loss they must be feeling. Periodically, groups of onlookers would begin praying or singing together, although some individuals were described as being traumatized, in actual states of shock, unable to speak. Despite the major positive of there being no loss of life, it was a somber, somber day for France. There is some hope, after all, however. 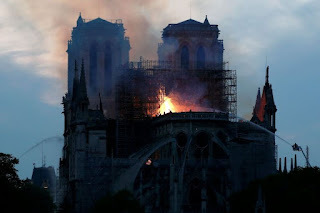 After hours of fighting the fire, which apparently caught on to and consumed the cathedral’s medieval wooden interior structures, officials proclaimed that major parts of the structure were saved—the outer stone walls, the front façade, and the bell towers, most importantly. That the fire spared the bell towers is great news, considering the iconic role the bells of Notre Dame have played in literature (especially in Victor Hugo’s classical novels) and in historical events, such as Napoleon Bonaparte’s coronation and France’s liberation from the Nazis at the end of WWII. 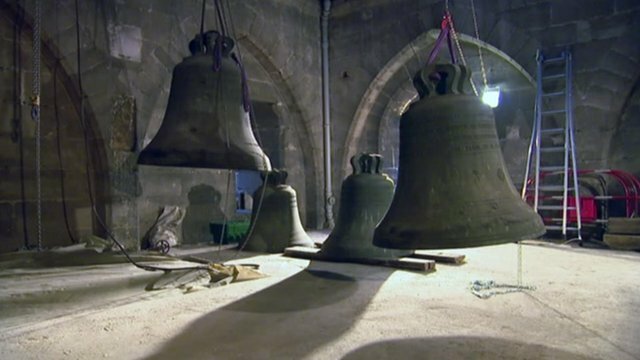 The bells of Notre Dame will toll again! Those bells have tolled out good times and bad for the French people--and even for us Americans, in response to the tragedies of September 11, 2001, and I can’t even imagine how horrifying their destruction would have been. 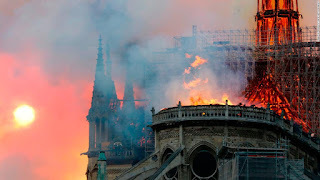 It will likely be a long time before we hear results from the investigation the French government opened up immediately regarding the fire’s cause, but we can be certain that we haven’t heard the last of this heart-wrenching event. French President Emanuel Macron has certainly been handed a shocking challenge, and we might imagine that a good part of his legacy will be determined by how he responds. His statement last evening was both eloquent and sensitive, and it reflected a deep determination to rebuild Notre Dame, and to rebuild it with the help of the best experts from around the world. So what we know today is still very preliminary, although CNN does report that the first emergency call came in from Notre Dame at 6:20 p.m., local Paris time, with the early flames coming from the cathedral’s attic first visible at 6:40 p.m. That, at least, gives us enough data for a timed chart, which should give us some early astrological perspective on this heart-wrenching event. In consideration of that, I’ve cast the chart below for 6:20 p.m., which puts some key placements on the Descendant, as we might expect for an event like this. Chart #1: Notre Dame Fire, April 15, 2019, 6:20 p.m. DST, Paris, France. Tropical Equal Houses, True Node. Cardinal “Zero”-point angles, Libra-Aries ASC-DSC. The zero-points of any Cardinal sign are considered “world points” because they typically pack a global, humanity-scale punch, and that’s certainly what we have here—an entire event chart built around a zero-point superstructure. 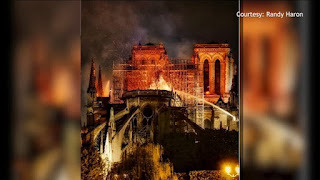 How appropriate for a fire in which nearly the entire wooden superstructure of the cathedral was destroyed—with Aries on the 7th house of allies and adversaries. Thankfully, the White House followed up with a more empathetic call to President Macron that offered American assistance in the rebuilding effort, and Press Secretary Sarah Sanders gave a compassionate statement of support. Let’s take the positives where we can find them! 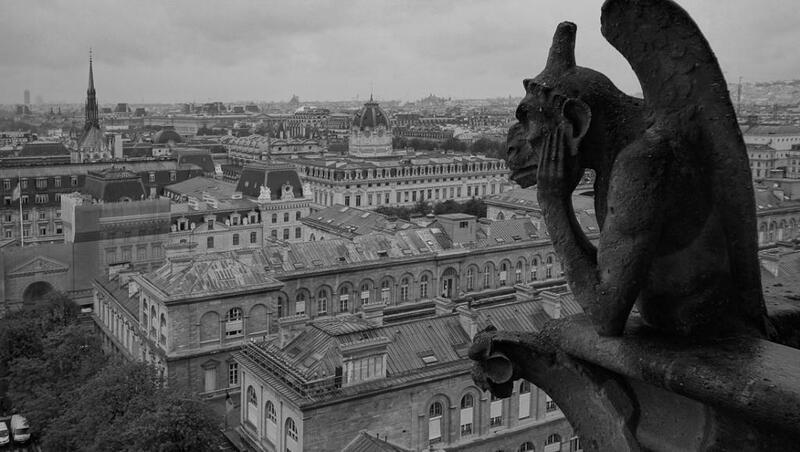 Parisians stood shocked and grief-stricken by the sight of Notre Dame burning. Jupiter (Rx, Sagittarius) widely conjoins IC (Capricorn) and squares Neptune-Venus-Mercury-DSC (Pisces-Aries). Even in retrograde condition, this fiery Jupiter could be one culprit in this scenario, ruling Sagittarius and co-ruling Neptune (Pisces) at the same time it squares that point. Jupiter’s impulse for rapid expansion could have promoted carelessness in some work being done on the structure. Even so, there's another, less tangible way of viewing all this, too. As many observers seemed to feel, the fire had symbolic (Jupiter-Neptune) weight for our times. Jupiter is more than capable of melding physical reality with metaphorical points—it might even revel in the opportunity to do so! It’s worth pointing out here that Jupiter rules the 3rd and 6th houses (the 6th, with Neptune)—perhaps accounting for the eerie way in which local Parisians just out for a stroll that evening (3rd house)—some even taking a river tour at the time—became up-close witnesses to this horror. The well-occupied Pisces 6th house reflects the potential involvement of workers in a religious institution that is regarded as a living symbol of the highest aspirations of humanity (Pisces Venus-Neptune). Notre Dame is largely considered the masterpiece of the medieval Gothic era of architecture, and raising humanity’s aspirations to new levels was its mission. As for those working on the ongoing renovations (hence the scaffolding outside), it’s fortunate indeed that none of them were hurt in the blaze. Along with these workers, this 6th house also reflects the critical and heroic role that France’s firemen (armed with Piscean water hoses) played in this event. The Cosmos does paint a picture, doesn’t it? Water had to be used very carefully to minimize the destruction. Uranus (Taurus) widely conjoins Sun (Aries), which conjoins Eris (Aries); Sun-Eris trine Jupiter (Rx, Sagittarius). The trines we see here span the 7th-4th house (Aries-Sagittarius), which befits a shocking, fiery event, if not an enemy attack (7th). Needless to say, this leaves many possibilities open: the “enemy” could turn out to have been a hapless worker who was careless with a cigarette, or a welder who let sparks fly a little too close to dry materials—or someone totally removed and unaware who just happened to be in the wrong place at the wrong time. 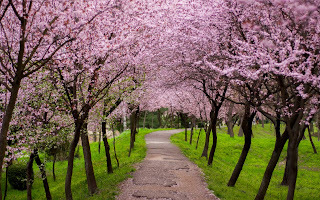 Trines allow energy to flow freely, and Jupiter’s retrograde condition could denote that energy was redirected in a way that didn’t help the situation. Could the fire have been contained earlier if only…? CNN did report that the first wave of firefighting crews were slowed down getting to the site because of rush-hour traffic, so who knows? It’s an unfathomable prospect, but the aspects we see here could also denote something malicious and/or intentional about the fire, although there’s no early evidence to that effect, and I hope there never will be. Wouldn’t we all prefer to think this was all just a horrendous accident? An early official report that emerged today, in fact, suggests that terrorism and arson are being ruled out as causes--I hope they're absolutely correct. As mentioned above, Jupiter co-rules the 6th house of workers here with Neptune (Pisces), which it widely squares, so it’s quite possible that the fire was triggered by one or more careless workers. The fated character of that possibility is supported by Jupiter’s quincunx to North Node (Cancer). With Neptune involved here (also trine No. Node), however, it may also be difficult to get to the truth. 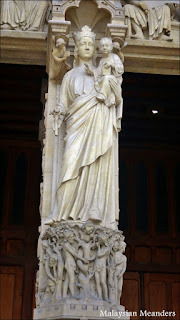 As Jesus's mother, Mary is the "Lady" celebrated as "Notre Dame"
Chiron conjoins DSC and Vesta (all Aries); these three points quincunx Moon (Virgo). The symbolism here denotes wounding (Chiron) by an enemy (DSC), directed at a sacred home (Vesta), and it’s is quite apt. Asteroids expert Demetra George names a number of religion-related keywords for Vesta, including clerical figures themselves and “altars and ceremonial objects, altar flames and hearth fires.” The cathedral was a working church—and according to reports, it was about to be closed down at 6:45 pm for Mass preparations when the fire became visible. That, and the fact that major Holy Week preparations would have been in full swing this week might make us wonder if the accidental misuse of lit candles, incense ashes or other ceremonial objects could have sparked the fire. Votive candles lit by visitors were apparently still lit after the firefighters completed their work—amazing! 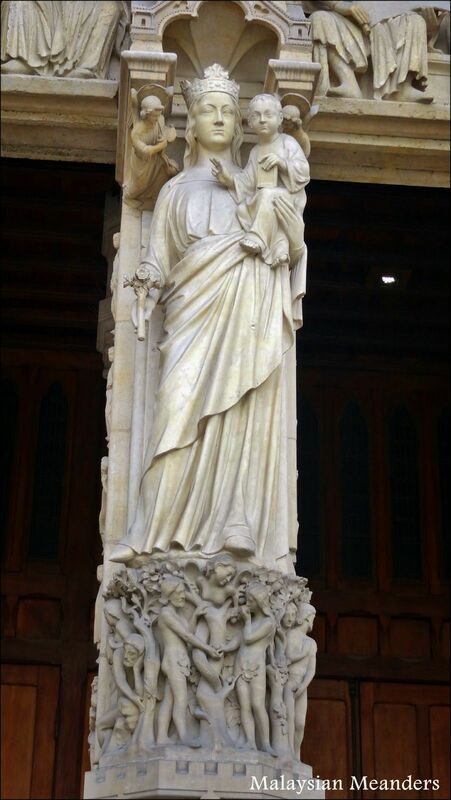 Judging from the universal horror expressed about this event, it’s probably safe to say that no one needs to be particularly “religious” or even Catholic to feel this maternal significance of Notre Dame—like Ceres, she represents much more than a set of beliefs. T-Square: Mars (Gemini) rules the 7th house from the 9th and opposes Ceres (Sagittarius); this axis squares Neptune (Pisces). We’ve seen above how appropriate this Ceres placement is for the situation, yet here we have both a call to action and an unfortunate overlay of suspicion in regards to the event. Already there are reports of "conspiracy theories" proliferating online in response to this event, which kind of goes with the Neptunian territory. Again, we really don’t think authorities will find any malicious intent or insidious enemy attack at the heart of this event--and so far they concur--but a Mars-Neptune square can raise suspicions and bolster "trolls," especially with Mars ruling the Aries 7th and Neptune trine/sextile the Nodal axis (Cancer-Capricorn). Neptune also sextiles Saturn-conjunct-Pluto and So. Node (Capricorn). Needless to say, the authorities (Saturn-Pluto) will thoroughly consider such possibilities before simply dismissing them. Attacking iconic structures for the sake of making a point has been done many times—9/11/2001 and the World Trade towers come to mind most recently—Saturn opposed Pluto for that event. So uncovering the truth will be key here, and the Saturn-Neptune sextile may hold out hope for that. France has had its share of terrorist attacks in the past several years, but let’s pin our hopes here on the fact that Mars isn’t at its strongest in Gemini and the square to Neptune is pretty wide. It’s notable that the French people have already sprung into action to gather funds for what will be an incredibly costly rebuilding project—perhaps the call to action carried by the t-square is the main point, after all, but time will tell. Officials are saying that it will be 3 years at least before the Cathedral re-opens. 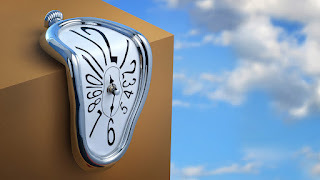 Exploring a significant event of this magnitude with the tools of mundane astrology always raises questions about how the event fits into the broader scheme of global events and trends: they all hinge upon the same set of planetary dynamics, after all. And it doesn’t take much rummaging around in the news to discover that these are volatile times: serious storms abound, which Jupiter square Neptune could be stimulating during oppressive feeling Saturn-Pluto times. Such "storms" could be geopolitical, as well--Sudan's leader was just forcibly deposed, the agony continues in Venezuela, Israel's attempt at a lunar landing crashed on the heels of a controversial election, and the list goes on. Politically, the U.S. is both frazzled to a crisp and tremendously stagnant all at the same time—Attorney General and Trump booster William Barr will finally grace us with his version of the Mueller report this week (we’ll see how credible any of it is, given his redactions), while Trump gets more and more anxious and agitated. When that happens he typically lashes out at the Dems, which is what he’s been doing: hammering so-called “sanctuary cities” with threats, and attacking Representative Ilhan Omar—one of two Muslim women we now have in Congress. It’s hard to defend some of the clumsy, ill-timed remarks Omar has made over her short tenure in Congress, but the recent ones Trump decided to pick on sounded (taken out of context) like she was downplaying the horrors of the 9/11 attacks. In response, Trump apparently turned to his radical right-wing buddies in the press (namely, the Rupert Murdoch-owned New York Post) to vilify her and hold her up as the visual poster child for 9/11. One commentator wisely observed that he is trying to paint her as the face of the Democratic party for upcoming elections. It’s going to be a long, long election campaign. On the plus side, more idealistic Dems have officially launched their presidential campaigns—notably, “Mayor Pete” Buttigieg and Cory Booker—and both, IMHO, express the higher Sagittarius-Pisces energies in play these days. More on them—and many other candidates—in future posts, for sure. So thankfully, we can end this on a cautiously optimistic note: those who feed off destruction, darkness and pain will always find their chances, but they are the backwards-looking opportunists who always bring themselves down in the end because time marches on. They test our resilience—we have to truly admire the resilience of our friends in France today—but there’s a light at the end of this Saturn-Pluto tunnel. I’m encouraged by the outpouring of service-oriented young people who want to serve and do right by the People—we need to encourage this generational shift to fresh, new leadership now. Meanwhile, it’s still true that we’re experiencing a sort of “end-times” with all the waning planetary cycles holding sway right now—events on the ground certainly reflect all that—but those waning energies will be completing their function of “draining the swamp” in the next year and a half, and a new set of much lighter dynamics should then allow us to move forward. 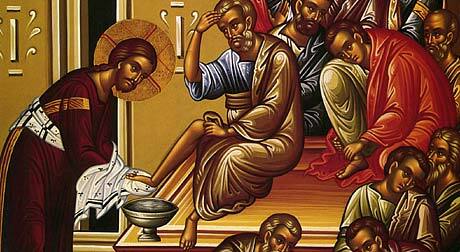 As with Notre Dame, there will be a resurrection that comes out of all this—not a bad message to take from Holy Week, whether Christian or not! Bottom line, we have a ways to go and probably many more challenges to confront before then, but hope springs eternal! France has seen and outlived far worse--with the world's help, this too shall pass! Demetra George and Douglas Bloch, Asteroid Goddesses: The Mythology, Psychology, and Astrology of the Re-emerging Feminine, Red Wheel/Weiser, 2003 ed., Newburyport, MA, p. 134.